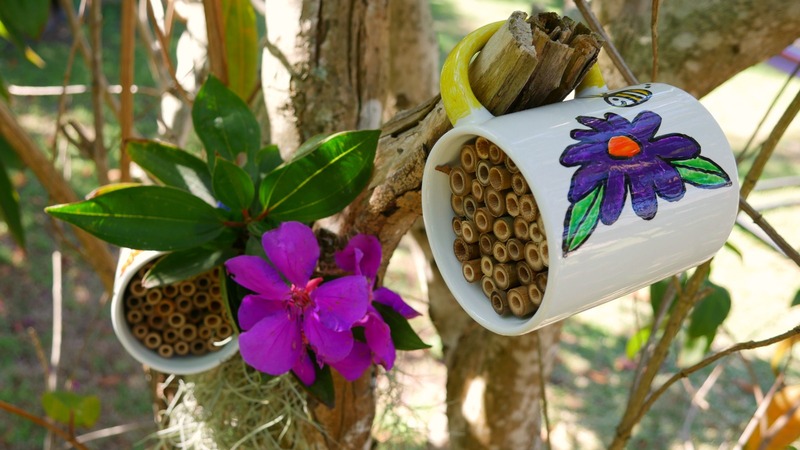 How to make a mug bug hotel your kids will love. 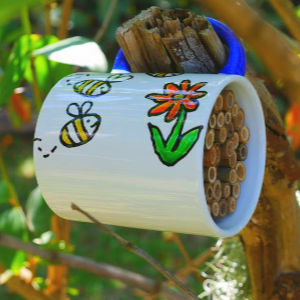 Want to learn how to make a mug bug hotel that your kids will love? My children have been bugging me for ages (you’ll get the joke in a minute) to build a home for the bees and bugs that visit our garden. This started after they participated in a project at school about the work that bees and bugs do to help pollinate and keep our food garden healthy. I’ve found they now seem to have less fear and more curiosity in regards to our small visitors. They can appreciate how hard our pollinators work to help us grow food. Plus, they now also see whose honey it is that they eat on their cereal in the mornings. Wanting a project that they could really own, we decided against building an upcycled bee hotel as we were hoping to keep all fingers and thumbs. We looked at different ideas for our project and decided to build a mug bug hotel because of the small size. An awesome creative project for the kids! 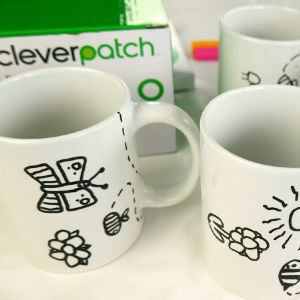 Our friends at CleverPatch were able to provide us with porcelain mugs and porcelain markers. The mugs are delivered in plain white and so are an unused canvas ready to decorate. Porcelain markers come in 8 different colours and are really easy to use, even for younger children. We started by planning our designs on pieces of paper with a pencil. This allowed the children to practise drawing their bees, butterflies, caterpillars and flowers. It also allowed them to consider how much space they had to draw on their mugs and to plan out their scene. Once they were ready, they used the black porcelain marker to draw the outlines of their designs. If they had a little slip-up, we discovered that a drop of water on a piece of cloth, carefully applied, would remove the offending error. We then allowed the mugs to dry – this just takes a few minutes. Then it was time to fill in the colour. Each bug, flower, butterfly and bee was coloured in with the utmost care, after all, these mug bug hotels will have important guests. To add a little bit of extra colour, some of the mugs also had their handle decorated. Once they were finished, the mugs were placed directly onto the shelf in a cold oven. We then switched it on and baked the mugs for 90 minutes at 160C. This sets the colour so it will not wash off. We bought some bamboo stakes which dad cut to size to fit in the mugs. He then spent a few minutes drilling down into each stake to give the guests a bit more room in their new home. Drill down as far as you can without going all the way through. I’m sure the bugs and bees will appreciate your effort. Tip: Dad found it easier to tape the stakes together before he cut them to length. Once the mugs were cool, the children filled them with the pre-drilled and shortened stakes and then found a lovely spot in the garden to hang them, near to the vegetable garden and surrounded by flowers. Now they have many hours of amusement watching bugs visit and knowing they have made a safe place for them to visit and stay. 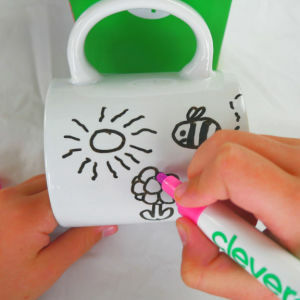 The mugs and porcelain markers would make a great project for so many activities. They are ideal gifts for Mothers and Fathers Day, a beautiful present for Grandma and I even enjoy my morning coffee from one. I can’t wait to see what you come up with!